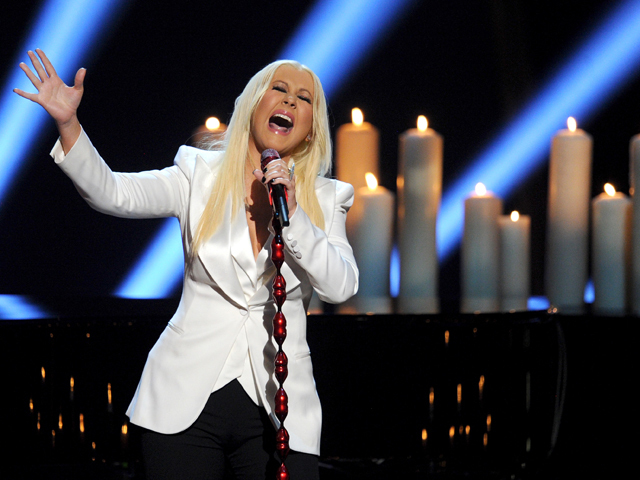 Christina Aguilera had a good night at the People's Choice Awards on Wednesday. She first took the stage to perform the heart-wrenching song, "Blank Page," from her recently-released "Lotus" album. The pop star remained onstage after the song wrapped to accept the People's Voice honor from actor Josh Duhamel, noting how "emotional" the song was to sing. She said the honor mean a lot to her, adding, "When I sing I truly believe that it's the only time I can truly be myself and express all of me...I find a home in music and I hope my music and my voice allows others to find a home as well." She then urged people who are being bullied use their voice, thanked her fans for sticking by her through the years and also gave a heartwarming shout-out to Mark Burnett, creator of NBC's "The Voice."